There’s a lot to occupy the thoughts of chief business officers in higher education these days. 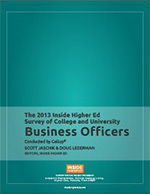 In addition to concerns that are universal in the commercial world such as rising operational and staffing costs, increased competition, and a rapidly changing marketplace, executives in colleges and universities also face business challenges unique to their industry. 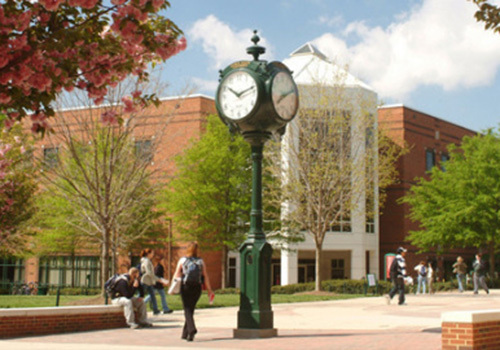 For the past three years, Inside Higher Education has conducted an annual survey of campus executives, taking the temperature on the kinds of issues confronting their institutions, and this year’s findings were particularly telling. 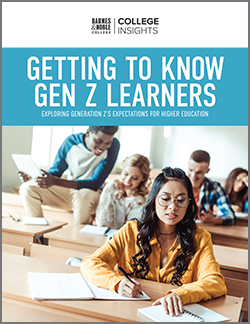 “In our 2012 survey, half of the respondents reported their institutions were in good financial health, and another 17% described it as excellent,” explained Inside Higher Education Editor, Doug Lederman in the introduction to last month’s webcast announcing the survey’s findings. “This year, we saw a very different side of things,” he added. Against the current financial backdrop, the 2013 Survey of College and University Business Officers survey revealed that although 27% of Business Officers still expressed strong confidence in the viability of their institutions’ financial model over a five-year forecast, that optimism dropped sharply over the long term with only 13% strongly believing that financial viability could be sustained over ten years. To help preserve that financial sustainability, student retention topped the list of strategies respondents had cited as a way to help grow revenue. 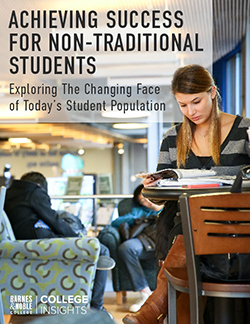 “There seems to be a recognition that the elasticity we’ve seen over the past decades in student fees may be at an end, and institutions will find it preferable to invest in holding on to the students they have,” suggested Lederman. When it came to cost-cutting strategies, 45% of survey respondents indicated their expectation of using technology and analytics to drive costs down, yet no more than 14% of those respondents agreed to any question relating to the availability of the kind of data and technology needed. “We need better data to evaluate better financial decisions,” agreed fellow panelist Jennifer Davis, Senior Vice President for Administration and Finance, George Mason University. “While we have excellent financial data, I’m really interested in what’s going on with students – if a student isn’t coming back to us in their sophomore year, we need to understand why,” she said. For answers to many of these problems, the survey pointed to building stronger partnerships and outsourcing everything from administrative to academic functions. “It’s a sign of the times that we need to look at outsourcing and opportunities for shared services where it makes sense,” Davis said. Her belief was borne out by the survey, which revealed 65% of CFOs were exploring more collaboration on academic issues, while close to 40% were exploring collaboration on administrative concerns.